While the world is focused on the Federal Reserve "tightening" monetary policy through its quarter point interest rate rise, it is important to keep in mind the Fed will still be purchasing $219 billion in U.S. treasuries this year. The Fed now has $2.5 trillion in treasuries on its balance sheet it acquired by printing money and purchasing the bonds (Quantitative Easing). If the Fed purchased a 5 year bond in 2011 for $100,000, the bond will be maturing this year. That means the U.S. government has to write the Fed a check for $100,000 which will now sit as cash on the Fed's balance sheet. As a quick side note; the Fed must hand back 95% of its annual profits to the government. If you understand how the circle of QE works you can see this implements a stealth process of eliminating the budget deficit over time. This is exactly what the Bank of Japan is trying to accomplish now as they are purchasing almost all Japanese Government Bond issuance, and they are a major buyer in stocks and corporate bonds. The U.S. will get there, we're just a few steps behind Japan in the endless depression playbook. Instead of funneling this money back to the treasury department, which would actually be a tightening of monetary policy, the Fed is reinvesting the $219 billion of cash back into treasuries. This helps keeps their balance sheet flat instead of allowing it to shrink further in size. The markets understand this reinvestment is far more important than the silly quarter point increase, and they keep a close eye on Fed speak to make sure this process will continue in the years ahead. There are $1.1 trillion in treasury bonds on the Fed's balance sheet set to mature through 2019 (there will be more coming as the Fed purchases bonds this year with less than 5 year maturities). 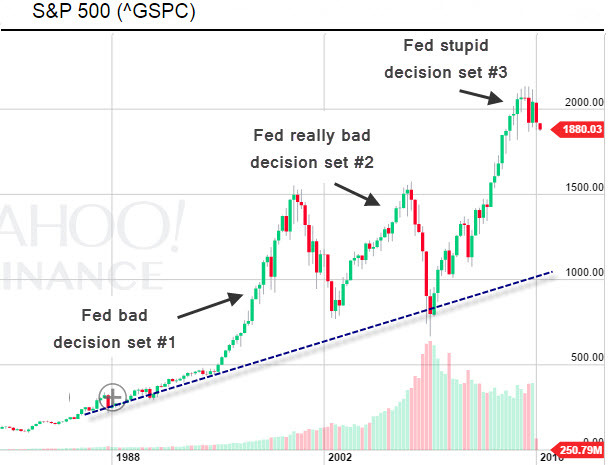 This is just another example that shows how the Fed is trapped and they have painted themselves into a corner. The real exit strategy, which they discussed during the announcement of QE 1 years ago, is to sell their bond holdings or allow them to mature. My bet is that their balance sheet grows over the next five years (more QE) before it is allowed to shrink. For those curious, the only thing that would cause the Fed to actually do the right thing is commodity based inflation (we have already experienced massive asset price inflation). With commodities sitting at 35 year lows and continuing to fall, that appears unlikely to occur any time soon.